Whether balloon decorating is a hobby for you, or you've chosen it as your profession or a side hustle, what's the one thing you need? The right tools and materials! The list below is by no means exhaustive, but it's a great place to start. Over time you'll develop your own techniques and little tricks what to use for which job. Click on the links (dark red text) to find more information about these items. These are the must-haves for every balloon decorator. With these materials, you can make some beautiful, yet simple designs - ideal if you are just starting out. High quality latex and/or mylar balloons. These are the nice-to-have things, that either make your life as a balloon decorator easier, or that help you to improve your creations (Hi-Float for example will increase the floating time of helium filled balloons significantly). Sturdy plastic boxes for easy storage and transportation. 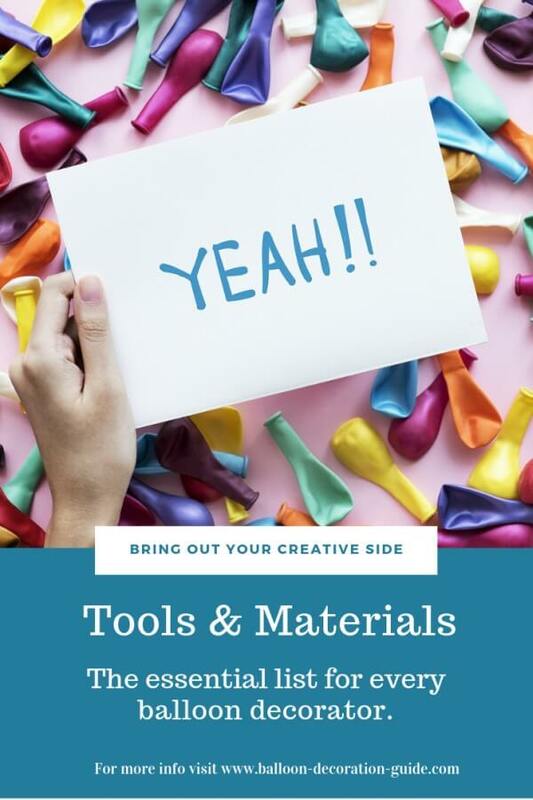 And finally, here's a selection of materials and tools that you will need if you either become a professional decorator, or if you want to create air-filled designs, where you need sturdy frames to attach your balloons to. Arch frame (commercially available or self-made). All of the above will be explained as we go step by step through each individual design.